The drive from Phoenix to the San Rafael Swell is long; further than many other canyoneering destinations of southern Utah, so we thought a pit stop was in order to break up the drive. Our “pit stop” had us leave the highway that parallels North Wash and head up into the slick rock expanse along a dirt road a dozen or so miles until our modest vehicle could go no further. The next morning following a short approach hike we dropped into the upper reaches of Stair Canyon as the drainage immediately slotted up so tight at the bottom we were forced to go high. With our backs against one wall and our feet against the other we shuffled down the canyon. The exposure was sustained and considerable, up to 40- feet off the deck in some places. Of course if you lost your purchase and fell you would never make it down that far. Crumpelstiltskinned! Despite this sustained exposure, the moves were rather easy and straightforward, but for me they were exciting enough. I am still not sure what my take is on high stemming canyons, also known as Mae West slots. One moment I am having fun, finding a groove and the next I can’t wait until it is over. All the while my lower back is getting rubbed ever more raw from the sandstone. In some places it seems so easy or natural to down climb to the canyon floor where the walls may be wide enough to fit for passage for a short distance. The desire for that warm blanket of solid ground at your feet can be convincing. Of course, the walls are only going to slot up again so tight that you would be forced to climb back up to a position where you could continue high stemming, wasting valuable energy in the process. Eric saw me eyeing the sirens’ song of the canyon bottom from my perch 40 feet up. “Stay away from the forbidden fruit,” he said. He didn’t have to tell me, I learned my lesson in Happy Dog Canyon. In the end I value the experience of these Mae West slots and this will undoubtedly not be my last, (but I wouldn’t count on me making a career of it.) 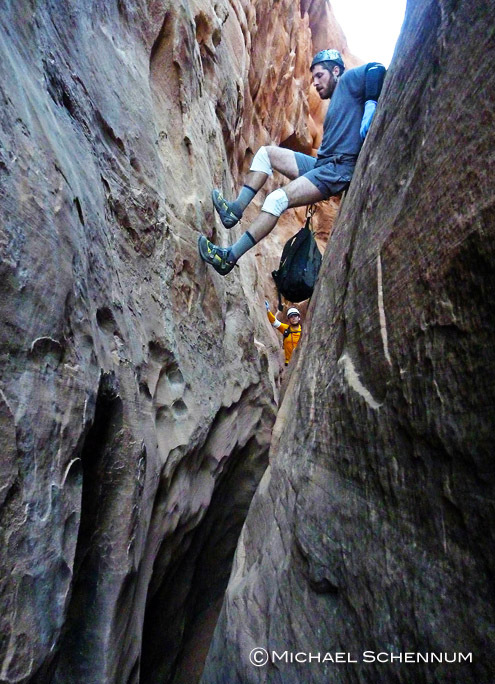 First, high stemming is a definitive part of the Colorado Plateau canyoneering experience. By participating in these descents even the easier ones such as Upper Stair Canyon, makes one a more complete canyoneer. The skills also transfer over to other canyon descents where high stemming is not the main course. Even more important, high stemming like perhaps no other discipline of canyoneering, with maybe the exception of multi-pitch big wall rappelling, not only requires but forces you to have total concentration. Your mind is completely devoid of any thoughts except for the task at hand. Not even the slightest mistake is an option, but unlike multi-pitch big wall rappelling, teamwork does not come into play all that much. Conversation is at a minimum. It is just you and the moves that you make with the walls and the space between them. David (left) and Brian on the hike back. Mike makes his way down to solid ground near the end of the high stemming section. Eric stemming high in the full sun. Mike, (from left) Eric and Brian on the rim just above the entrance into Upper Stair Canyon. Laura and I had been trying to get out on a canyon together all summer. With a 9- month old at home our opportunities are few and far between. We had planned on going canyoneering in the middle of the summer but the monsoons kept us at home. A second opportunity presented itself as my parents were out visiting. With a favorable forecast we ventured to Shamrock Canyon. It was wonderful getting to spend some alone time with Laura, particularly in such a beautiful setting. This was Laura’s first descent of Shamrock and my second. The canyon was more challenging than my memory served me, which may have had something to do with the fact that water levels were considerably lower than my previous descent. Never the less we made quick work of the down climbs, rappels, wades and pot hole escapes and reached West Clear Creek all too quickly. The only unpleasant moment during the descent came when Laura had an encounter with some sort of Stinging Nettles species. We relaxed for a while along West Clear Creek before the slog back home. During the hike out Laura and I talked about how few times we have descended technical canyons without the company of others. We could only remember of one previous descent, Stone Donkey. Canyoneering is such a social sport that we cherish that shared time with our friends, but today we were glad it was just the two of us. 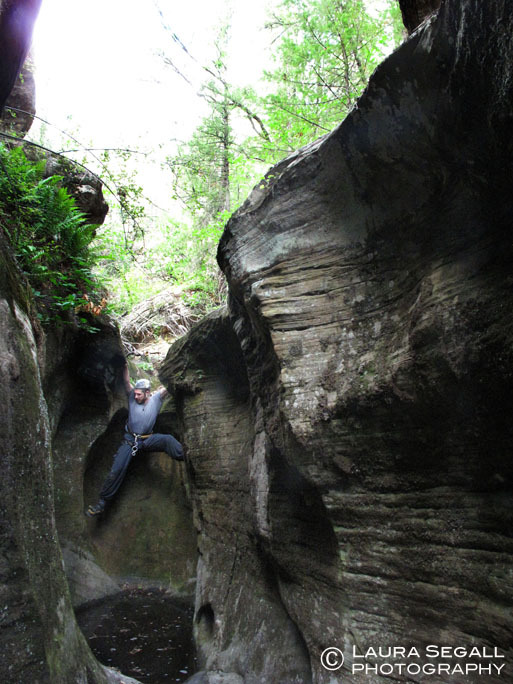 David reaches for a foothold on a tricky down climb in the upper reaches of the canyon. Laura clambers out of a pothole. David in a nice section of narrows. Laura wades through a pretty room. David looks on at the bottom of a rappel. Laura hikes in a meadow alongside West Clear Creek.